I can’t believe I am only on the 3rd outfit from fashion week. You are all going to get tired of me talking about it but I promise as soon as I finish sharing everything things will get back to normal. On day 3 I only had one show to attend at night for Venexiana. (gorgeous dresses!) During the day I took pics, had lunch and went to visit a showroom that I will post about in my NYFW Diary coming soon! I decided to go for something a little more simple this day by mixing subtle prints. I thought this skirt was super cute and I really loved the print & style. It’s really girly and chic, just the way I like it! I didn’t want to go with a plain top, so I found this one that has an embroidered print and decided to pair the two together. It was hard to see the details from far away, but up close in these photos it stands out much more. I have a huge obsession with moto jackets so I got really happy when I found this one at H&M because it’s a velvet material, making it a little dressier. I like mixing different textures. I think it adds dimension. 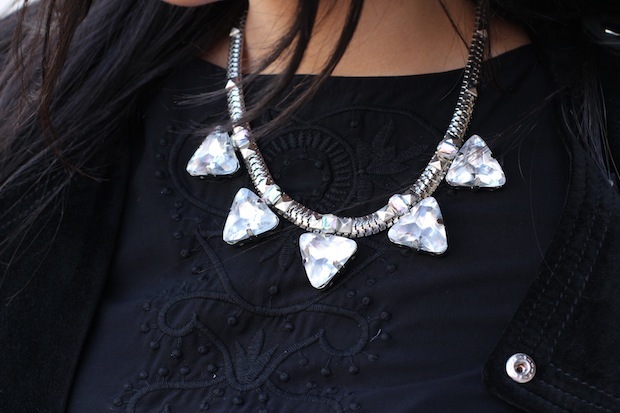 The final touch was my red lip and this pretty statement necklace to make the outfit pop a little more. I lived off of skinny vanilla lattes during fashion week! One of the best things in NYC is that there’s a Starbucks on almost every block. Super chic! I love the jacket and you always have the best shades! Get it boo! Amazing! Those shoes are a dream! I love this first picture of you – gorgeous! So pretty and chic, that's one cute dress! Vanilla lattes are the best of the best! Love you looking So pretty,love the embroidery on the top,very classy ..am waiting for more..!! Love this look!Beautiful as always! That is seriously one gorgeous outfit, you look gorgeous babe! Great outfit as always Nat! Such a beauty!